The Anglo-American ‘Special Relationship’ has been known to exist as a close alliance between the President of the United States and the Prime Minister of the United Kingdom since the days of FDR and Churchill forged during the Second World War. It is called special because of the unique historical and cultural bonds of kinship that unite the American and British peoples through a perceived shared heritage, common political/social/economic values and language. Together over the course of 72 years it has been the White House with the support of 10 Downing Street as its principal strategic leading ally in Europe. The so-called 'Special Relationship' is an unprecedented coming together and sharing of two nation states intelligence and national security infrastructures and spy-intelligence organisations. The US-UK relationship is highly integrated at an intelligence, defence, foreign policy and security level. As well as being two highly developed, mature, sophisticated economies that do a tremendous amount of trade and investment with each other there are cultural affinities with a shared language and common ancestry. At a political level the relationship between the President of the United States and the Prime Minister of the United Kingdom is an institution of the Anglo-American special relationship and the poster child of it. When it has been good and based on mutual admiration and mutual chemistry with a strong bond of friendship such as Margaret Thatcher and Ronald Reagan, Tony Blair with Bill Clinton and George W Bush, John F Kennedy and Harold Macmillan and FDR together with in war time arms Churchill it has served to create an aura of confidence and glamour as well as excitement in the conduct of Western global leadership under the American order. Low points included the evident cold body language and distaste Edward Heath had for Richard Nixon. Also Harold Wilson fell out with President Johnson regarding not having British involvement in the Vietnam War. British Conservative Prime Minister John Major did not get on well with American liberal 'New' Democrat President Bill Clinton regarding differing positions on the Irish peace process and Northern Ireland as well as Major helping Republican George Bush during the 1992 Presidential Election. 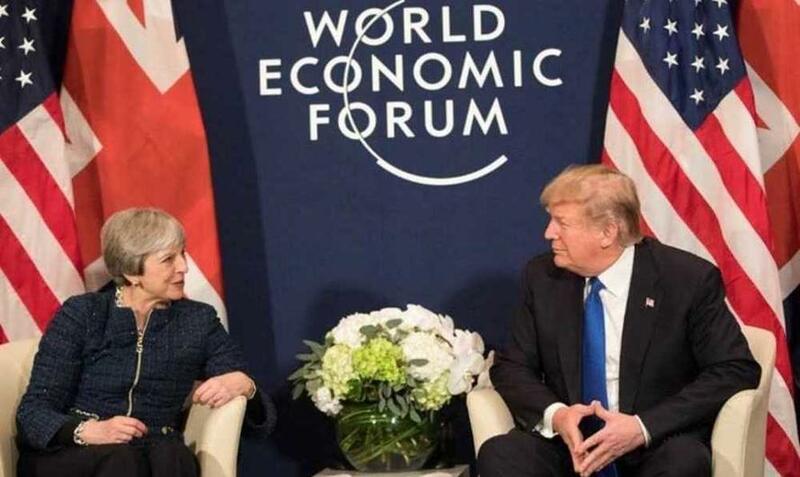 Now, quite possibly the US-UK “special relationship” has suffered serious damage and could be at its lowest ebb ever, which will have tremendous consequences for the UK's position in the world going forward outside of the European Union. The relationship and alliance has always meant far more to London than to Washington DC. But in so heavily involving the British intelligence services in interfering in the 2016 US Presidential election directly working against the Republican candidate Donald Trump and in favour of the Democrat candidate Hillary Clinton, the British State may just have crossed a red line to far in the mind of President Donald Trump. There has been much banging on about Russian interference in the 2016 US Presidential election. This of course is never spoken of in the context that various American and British Governments have not only covertly interfered and intervened directly in other countries internal democratic elections and political systems such as the case with the British Conservative Government of John Major attempting to help the Republican Bush 1992 campaign against Bill Clinton, but also overtly, such as was the case with Iran after WWII. However, the more one learns of the extent of the British intelligence state's involvement in the 2016 US Presidential election working in favour of Democratic candidate Hillary Clinton, the more one begins to see that an argument can be mounted that the level of British State intervention in the 2016 US Presidential election to help tip the balance in favour of one candidate against the other is unprecedented. Such is the case of one British political 'activist' by the name of Simon Bracey-Lane who mysteriously worked as an activist for the Bernie Sanders 2016 Presidential campaign and a very strange organisation called The Institute of Statecraft which runs something spuriously called the 'Integrity Initiative'. The Institute for Statecraft and its Integrity Initiative is a front for the British Government's intelligence services. It is funded largely by the British Foreign Office and NATO Governments. It came into being in 2015 long before Donald Trump was ever perceived to be a serious candidate for the White House and its sole purpose is to continue in that most ridiculous and backwards 'Cold War' mentality of smearing all things Russian and smearing anyone who takes a positive interest and positive perspective on Russia and the great Russian people. It would seem Bracey-Lane was an agent of the British Government on a mission to collect up data on Bernie Sanders, the chief rival for the Democratic nomination to Hillary Clinton back in 2016 and then in all likelihood pass such data to the 2016 Clinton Campaign. The British Government at the time at made it known it wanted Hillary Clinton elected President. Senator Sanders was of course a left wing firebrand, the closest American politics gets to having a socialist, who was lukewarm towards Israel and intent on revolutionising American domestic and international policy to take it in a more progressive and liberal internationalist direction. Sanders wanted to reform the bloated US defence budget and military-industrial complex and attempt to tone down aggressive impulses in American foreign policy. With a little extra push in a few primaries and caucus he might well have secured the Democratic Party nomination. This involvement by the British State in the internal political affairs of the United States is disconcerting. Not only did the British State intervene extensively in the 2016 US Presidential election to tip the balance towards the Democratic candidate Hillary Clinton, it has at the same time being displaying a deeply ingrained prejudice and bigotry against all things Russian. Indeed, over the last few years the level of anti-Russian hysteria in England alongside the level of anti-EU hysteria has been an appalling and irrational spectacle to behold. Even in English police stations they now have posters up about how to look out for 'Russian gangs' etc. which is absolute rubbish, but then the English police are themselves utterly rubbish, as the world has witnessed recently with the disgraceful bungling of the Gatwick Airport drone fiasco. The English really need to calm down and focus on their own internal affairs such as the mess they have created for themselves with this thing of theirs called Brexit. This British Government front called the Institute for Statecraft and its 'Integrity Initiative' was launched in 2015 by the British Government as a secret operation to propagate anti-Russia propaganda into the western media stream and create generally an aggressively hostile anti-Russian media narrative, for what purpose and to what end only the British Government and those who hold such severe and obsessive anti-Russian opinions can answer. The Institute for Statecraft and its 'Integrity Initiative' programs where designed to smear anyone who does not follow the anti-Russia line. The Steele dossier which has been of such great help to the Robert Mueller Special Counsel Investigation was also a largely a British Government operation but seems to have actually emanated from this Institute for Statecraft mission. The 'Integrity Initiative' builds 'cluster' or contact groups of trusted journalists, military personal, academics and lobbyists within foreign countries. These people get alerts via social media to take anti-Russian action when the British State perceives a need. It would seem there are some at the very highest levels of the British State who would like nothing more than to start an all out war against Russia, which would be the gravest strategic and human mistake probably made since the last monster thought he could achieve such a diabolical scheme circa 1941. And perhaps there are some at the top of the EU who have never forgiven nor gotten over that it was Russia that was the main liberator of the European continent against the German Nazi Third Reich and it was Russia who was the principle and superior opponent against the Wehrmacht. Yet the fact of the matter is as per usual when the English are involved they generally end up causing more damage than good. All these anti-Russian efforts by the British State and involvement in the internal affairs of American politics such as infiltrating the Bernie Sanders campaign and gathering up a dossier on Donald Trump has ironically and paradoxically served to actually weaken to its worst level the US-UK 'special relationship'. Quite possibly US-UK relations are at their lowest point. The management of the President of the United States' visit to the UK was a public relations disaster for the British Government of Theresa May and Mr. Trump has made it quite clear he has little time for the British Prime Minister, openly attacking her handling of the Brexit negotiations, openly pining for Boris Johnson to replace her and openly stating that a US-UK Free Trade Agreement post-Brexit is not a certainty. Also President Trump has little time for Britain's defence establishment and its pathetic and ridiculous Henry Jackson Society so-called Defence Secretary Gavin Williamson. President Trump cannot stand pip squeaks like Gavin Williamson and that is why Trump kept the entire British Government in the dark about his troop pull outs in Syria and Afghanistan.